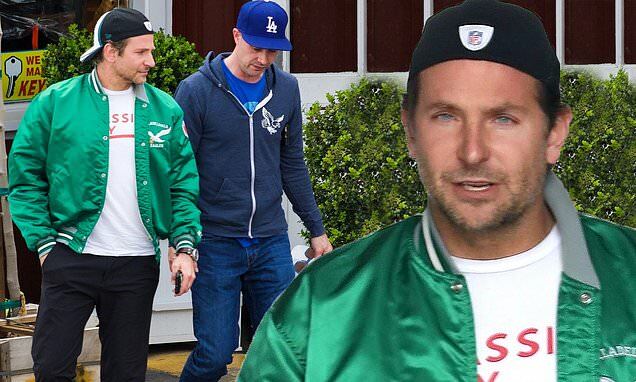 Bradley Cooper, 44, chatted it up with Freddie Prinze Jr, 43, while out to lunch with the actor in Los Angeles on Monday. The friends walked side-by-side after leaving an eatery in L.A.'s Brentwood neighborhood. It's likely they were talking about working on a new project together. After their meal, the duo headed to their cars. Cooper, whose partner is Russian supermodel, Irina Shayk, 33, was captured wearing black jeans and sneakers with red accents. He paired the pants with a green Philadelphia Eagles bomber jacket and white t-shirt with red writing underneath. The A Star Is Born actor also rocked a backwards ball cap. The Academy Award nominee showed off his scruff as Freddie followed him out of the restaurant. Like Bradley, Freddie also kept it casual.